Provenance: Spink & Son, Ltd., London, 1984. 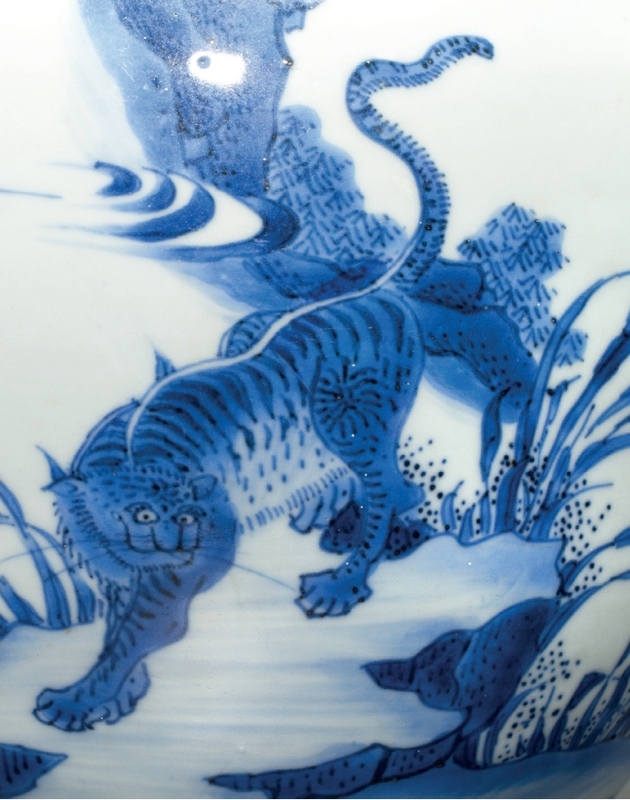 Notes: The combination of the long-tailed tiger and the scaly dragon emerging from clouds appears to have been a popular theme on a variety of porcelain shapes produced during the Transitional period. 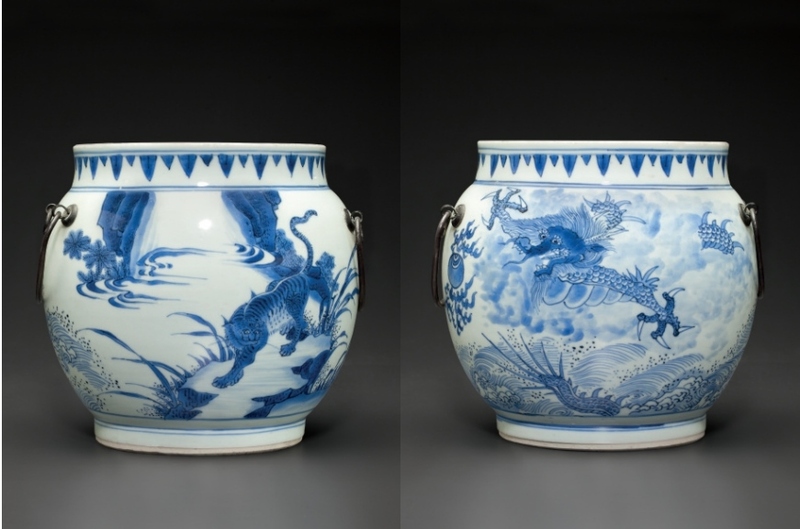 For an ovoid jar and cover with a dragon and similar tiger to the present example, see S. Marchant & Son, Exhibition of Chinese Blue and White – Wan Li to K’ang Hsi, 1980, no. 50. 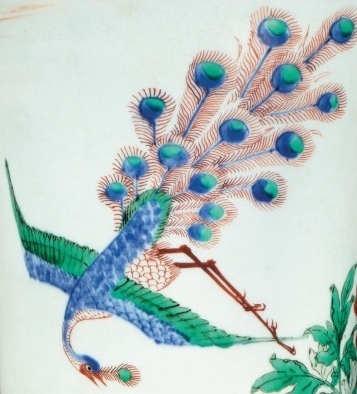 The two animals also appear, together with the kylin and phoenix, on a vase in the Walters Art Museum, Baltimore, illustrated by Michael Butler, Julia B. Curtis and Stephen Little in Shunzhi Porcelain: Treasures from an Unknown Reign, 1644-1661, Alexandria, VA, 2002, p. 99, no.7. 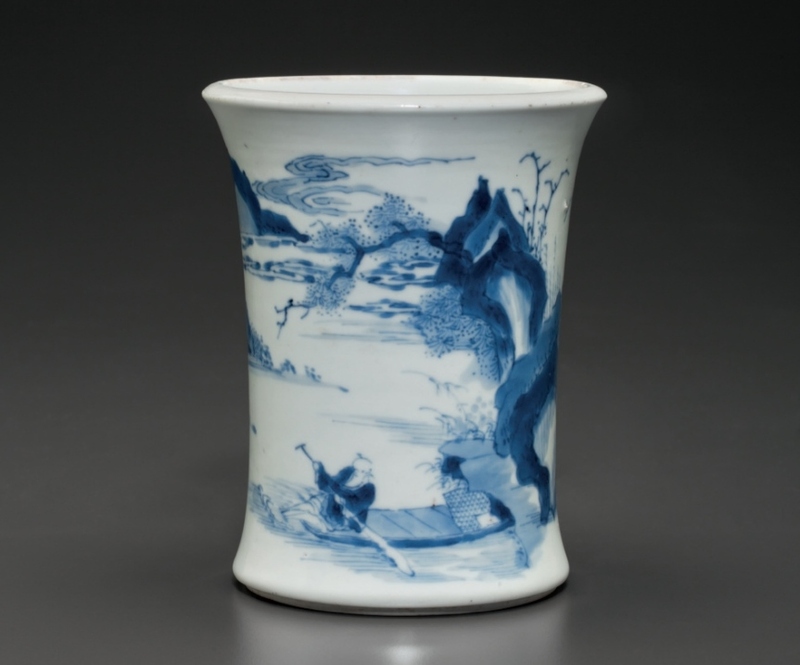 Also see lot 3546 in this catalogue for a wucai beaker vase decorated with this theme and a discussion of its Daoist undertones. Provenance: Joseph M. Morpurgo, Amsterdam, 1984. 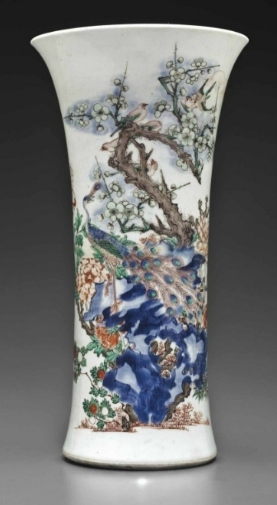 Notes: The unglazed channeled foot on the present lot, as well as on lots 3580, 3581, 3589, and 3591 in this catalogue, appears to have been used by the potters at Jingdezhen for a short period of time around 1670, and disappears in the second half of the Kangxi period. Provenance: Bluett & Sons, Ltd., London, 1983. S. Marchant & Son, London. Spink & Son, Ltd., London, 1984. 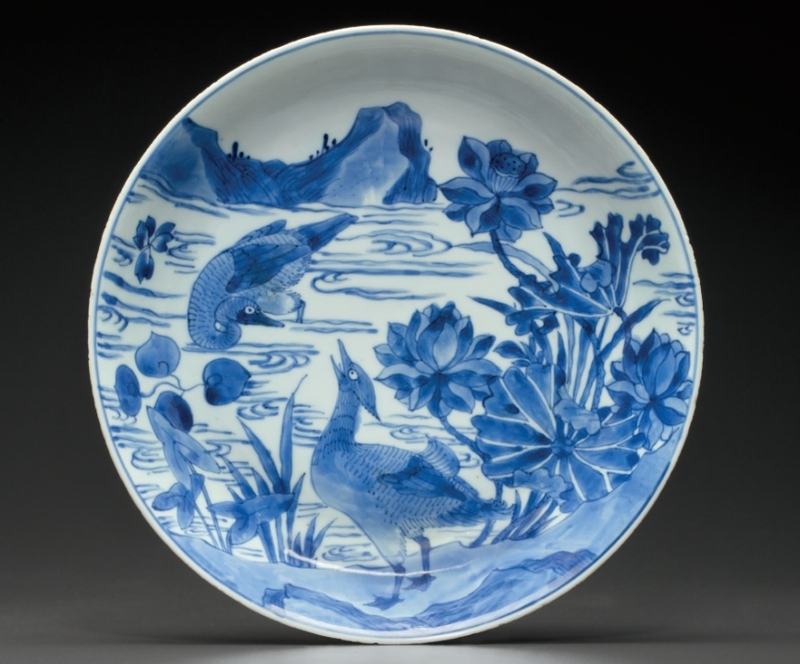 Literature: S. Marchant & Son, Ltd., Exhibition of Chinese Blue and White-Wanli to K’ang Hsi, London, 1980, no. 51. 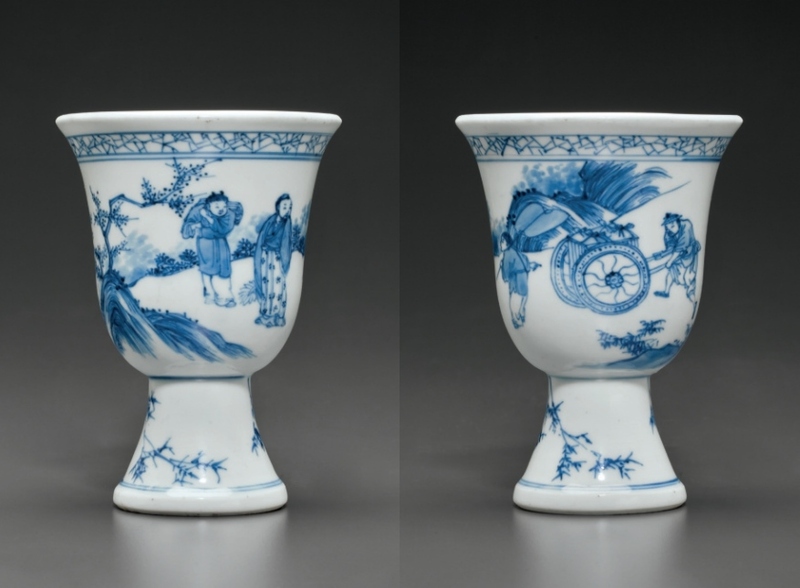 Exhibited: S. Marchant & Son, Ltd., London, Exhibition of Chinese Blue and White-Wanli to K’ang Hsi, 13-25 July 1980. Notes: Zhang Qian was a Han dynasty imperial envoy and traveler. 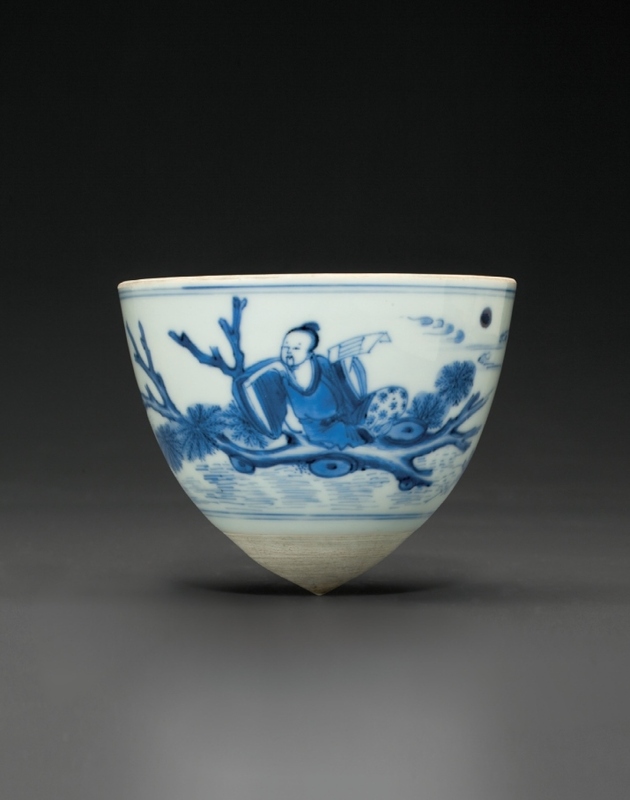 He is more usually seen depicted on rhinoceros horn ‘log-raft’ cups and carvings of Kangxi date, such as the example sold at Christie’s Hong Kong, 30 May 2012, lot 4162. The rhinoceros horn cups are thought to have been inspired by earlier silver prototypes such as the one in the National Palace Museum, Taiwan, dated to the 14th century and another formerly in the collection of Sir Percival David and now in the Cleveland Museum of Art, dated to the Ming dynasty, probably 16th century. Both of these are illustrated by J. Chapman in The Art of Rhinoceros Horn Carving in China, London, 1999, p. 263, nos. 382 and 283, respectively. It is rare to find this subject as decoration on porcelain. 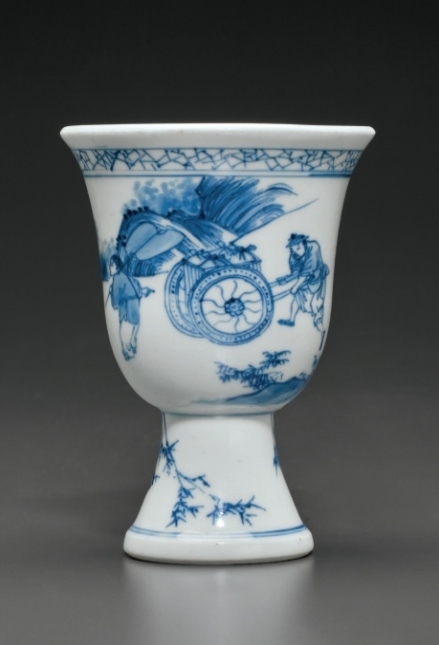 A rare small rolwagen decorated with this subject, from the Shanghai Museum, is illustrated by Sir Michael Butler and Wang Qingzheng in Seventeenth Century Jingdezhen Porcelain from the Shanghai Museum and the Butler Collection: Beauty’s Enchantment, London, 2006,p. 141, no. 37, where it is noted that “Zhang Qian from the Western Han dynasty was famous for going to the Western region and promoting cultural and economic exchanges between the East and the West. Legend says that he had been to the headstream of the Yellow River, in order to regulate the water and to avoid future flooding”. By accident he found himself floating along the Milky Way (River of Heaven). From there he caught sight of the Weaving Main and the Cowherd, who were forced to be separated by the Milky Way and can only cross once a year on the 7th day of the 7th month, when a bridge is formed by magpies. Another example decorated with this subject, a rare ovoid jar from the Transitional period, was sold at Christie’s New York, 24 March 2011, lot 1682. Provenance: J. Reuben Antiques, London, 1987. Notes: Peacocks have long been admired for their great beauty and in many cultures legends have grown up concerning the origin of peacocks and their symbolism. In China, as early as the Han dynasty peacocks are found in literature, such as the well-known yuefu called ‘A Pair of Peacocks Fly Southeast’, which tells of the unwavering devotion between a couple torn apart by their families. By the Tang dynasty peacocks were well known in China, and indeed some districts paid tribute in peacocks, their feathers being used both for imperial decoration, and for the designation of official rank. Later, in the Ming dynasty, the peacock became established as the insignia of civil officials of the third rank. However, as early as the Tang dynasty, peacock feathers were apparently bestowed on both civil and military officials as marks of imperial favor, rewarding faithful service. According to legend, the founder of the Tang dynasty was associated with peacocks. The story tells of the beautiful and talented daughter of a military commander, Dou Yi. The daughter was fond of painting and embroidering peacocks on screens, and in AD 582 it was decided that her future husband should be chosen by seeing which archer could shoot the eyes from one of the peacocks on her screen with two successive shots. The successful candidate was eventually the man who was to rule China as Tang Gaozu (AD 618-26), and so the Commander’s daughter became an empress. By the Tang dynasty there are clearly recognizable depictions of peacocks in both religious and secular Chinese art. Peacock feathers were also sometimes used to sprinkle water on altars, and are associated with a number of Buddhist deities. The peacock is particularly associated with the bodhisattva Avalokitesvara (Guanyin), who enters the Chinese Buddhist pantheon in male form but comes to be represented in female form, especially in relation to the role of Goddess of Mercy. One of the stories relating to the Chinese Guanyin in female form tells of Guanyin summoning a large bird with dull plumage, sweeping her hands across her own face and then over the feathers of the bird. The bird was suffused with brilliant lights and colours, to the extent that other creatures had to look away. When they looked back they saw that each of the bird’s 100 tail feathers contained an eye. Guanyin explained this by saying that, as she was unable to be omnipresent in watching over them, the eyes in the peacock’s tail would keep watch for her and remind them of her constant care. Peacocks had significant associations with several religions, and were prized by royal houses all over Asia, not only for their symbolic importance but for their extraordinary beauty. Provenance: Acquired in London in the 1980s. Literature: Julia B. Curtis, ‘Transition ware Made Plain: A Wreck from the South China Sea’, Oriental Art, Vol. XXXI, No. 2, Summer, 1985, p. 169, fig. 15b. Provenance: Jan van Beers, London, 1984. 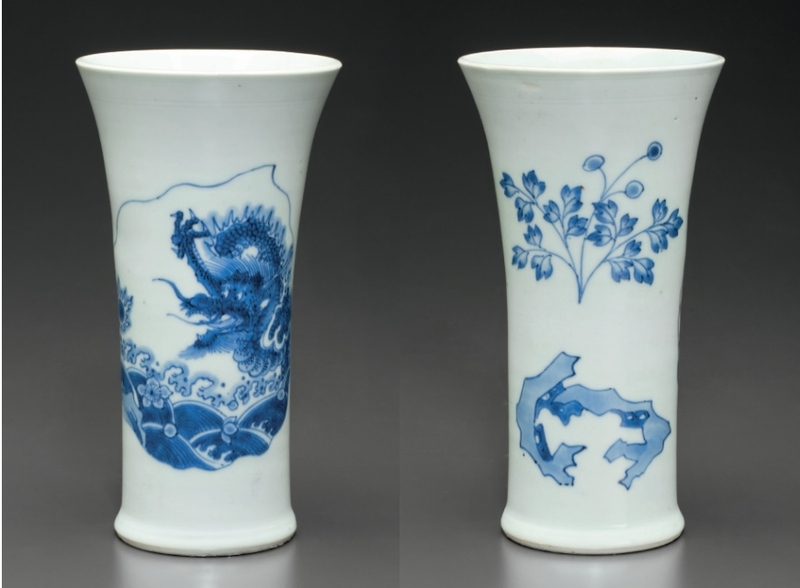 Notes: The dragon had long been a favored motif in Chinese art, and it continued to be used as a decorative motif on Transitional wares. 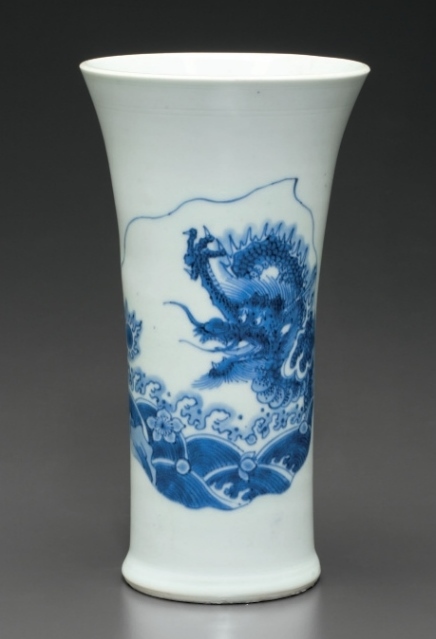 A symbol of imperial power, the dragon appeared on Chinese porcelains as early as the 14th century. Its meaning shifted slightly through China’s different political periods. 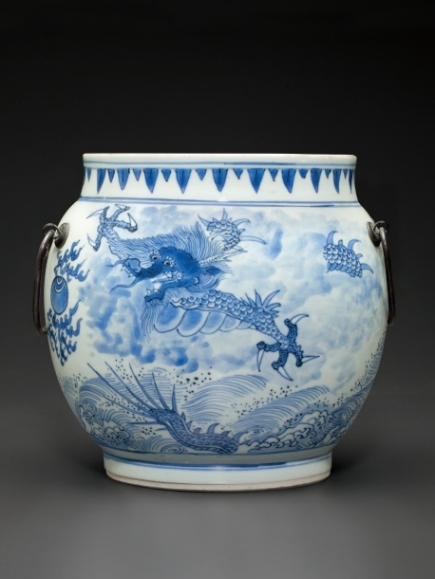 In reference to a Ming dynasty leys jar in the Lenora and Walter F. Brown Collection decorated with a five-clawed dragon, illustrated by Julia B. Curtis in “Tales told in Porcelain: Jingdezhen Blue-and-White Wares at the San Antonio Museum of Art,” Orientations, April 2005 (p. 48, illustrated p. 49, fig. 8), Dr. Curtis notes, “During the Han dynasty, the dragon was the symbol of the east and thus associated with sunrise and spring rain which bring fertility and fecundity. The dragon was always related to water… Thus the dragon came to signify the power of creation, and to be embraced as the giver of life and the life force, and as such, to symbolize the person, power and benevolence of the emperor. During the Ming and Qing dynasties, use of the five-clawed dragon as an imperial decorative device was strictly enforced by sumptuary laws”. Provenance: Collection of Max Robertson, London. Heirloom & Howard, Ltd., London, 1984. 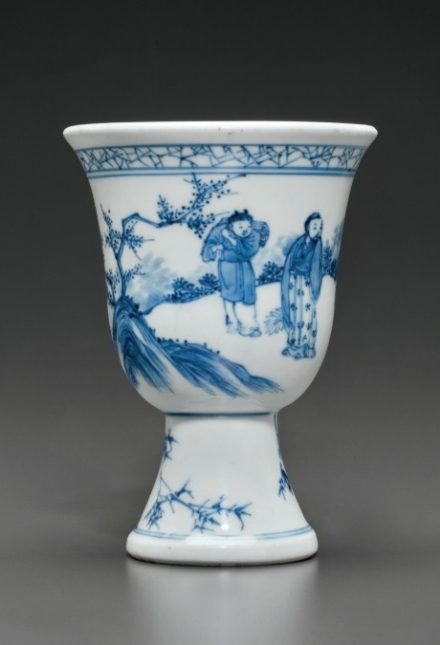 Notes: The poem ‘Eight Immortals of the Wine Cup’ (Yinzhong baxian) was written by the famous Tang dynasty poet Du Fu (AD 712-770) who, like many Tang dynasty men of letters, derived considerable enjoyment, and, apparently, inspiration, from drinking wine. In his poem he chose to celebrate the drinking habits of other literary men of his time, including that of his great friend Li Bai (AD 701-762). 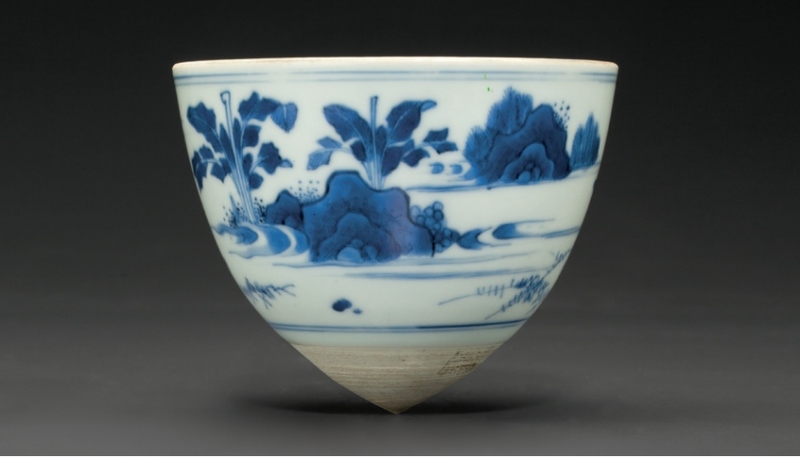 The poem provided the subject for paintings at least as early as the Yuan dynasty (1279-1368), and appeared as decoration on porcelain in the Qing dynasty Shunzhi reign (1644-1661), although it was particularly popular in the Kangxi reign (1662-1722) (see lots 3587, 3588). Provenance: Sotheby’s London, 19 November 1985, lot 4. S. Marchant & Son, Ltd., London, 1985. 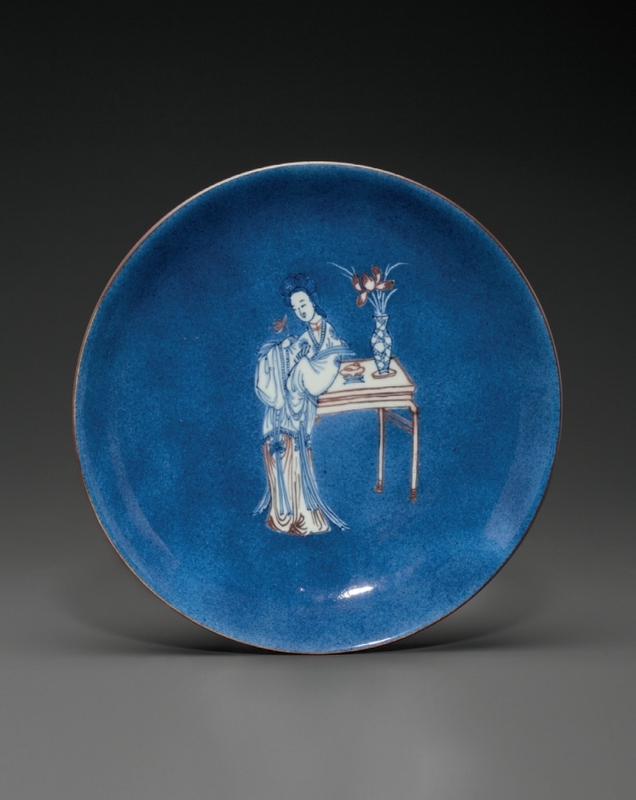 Notes: Two large dishes of similar proportions, also decorated with the ‘Eight Daoist Immortals’, were illustrated by Michael Butler, Julia B. Curtis and Stephen Little in Shunzhi Porcelain: Treasures from an Unknown Reign, 1644-1661,Alexandria, VA, 2002. 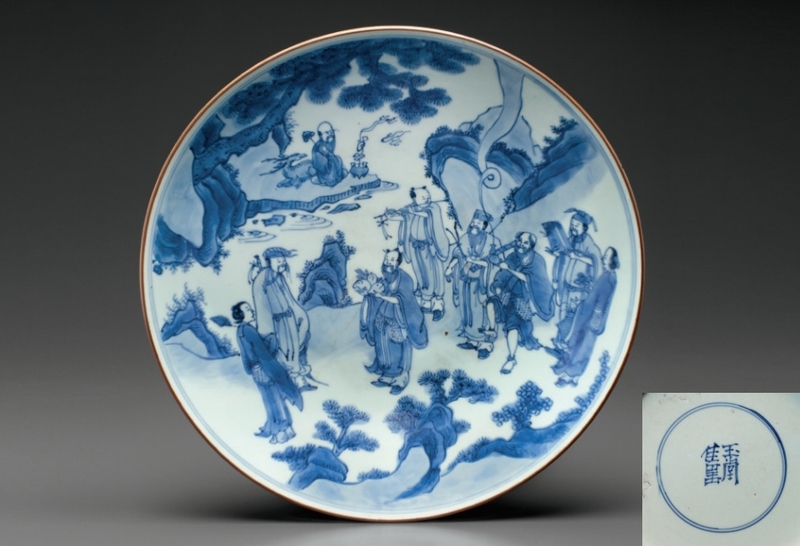 The first, from the Butler Family Collection, decorated in the wucai palette (p. 224, no. 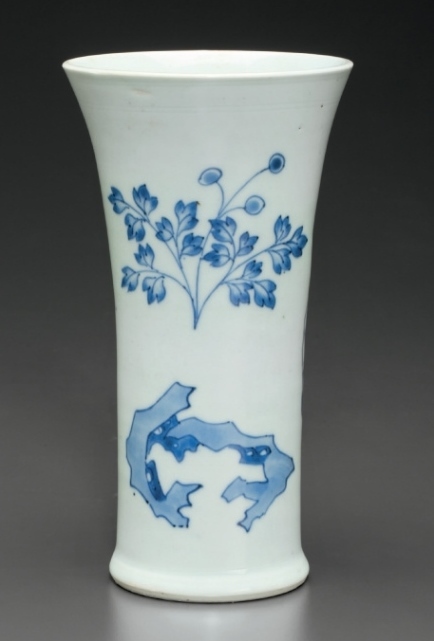 75), and the second, from the Collection of Caromy Hoare, decorated in underglaze blue (p. 225, no. 76). Both examples bear the same mark inscribed on this lot, which is noted by Sir Michael Butler to be a commendation or ‘omen’ mark that was popular in the Shunzhi period. The theme can also be found on two other pieces from the Curtis Collection, a large bowl (lot 3559), and a small vase (lot 3564). 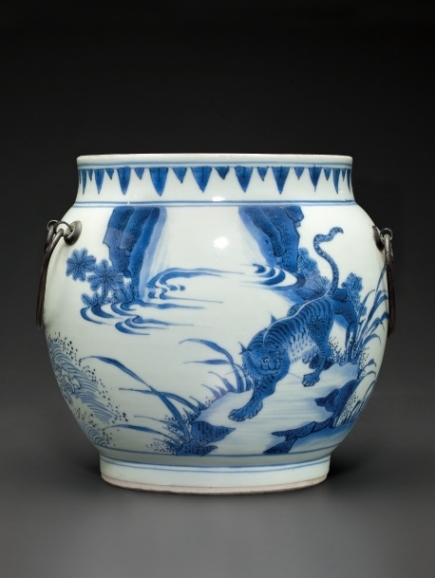 Another blue and white example in the Palace Museum, Beijing, is illustrated by Chen Runmin in Selected Chinese Ceramics from the Palace Museum (Volume 1): Blue and White Ceramics in Shunzhi and Kangxi Periods (Qing Shunzhi Kangxi chao qing hua ci), Beijing, 2005, pp. 38-39, no. 17, and also bears the same commendation mark. Another was sold at Christie’s London, 12 May 2009, lot 160. Provenance: S. Marchant & Son, Ltd., London, 1986. 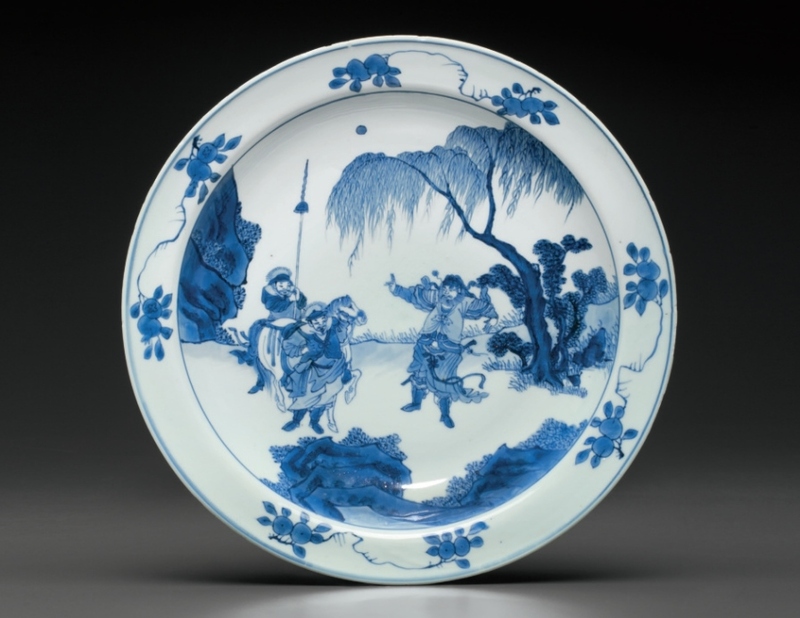 Notes: A nearly identical dish is in the Rijksmusuem, Amsterdam, and is illustrated by Christiaan J.A. Jörg in Chinese Ceramics in the Collection of the Rijksmuseum, Amsterdam: The Ming and Qing Dynasties, London, 1997, p. 127, no. 130, where the author notes that the orchid is the symbol of friendship, love and beauty. Fig. 1: Lady at a Window By Zhang Zhen, 17th century. Hanging scroll, ink and color with gold on silk. Signed: Guangling Zhang Zhen, with two seals of the artist, 57 x 25 in. (144.5 x 63.5 cm.). 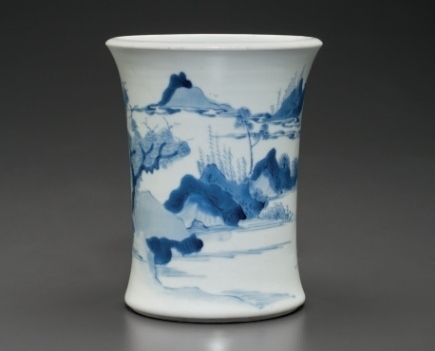 Sold at Christie’s Hong Kong, 6 July 2003, lot 425.